Who’s going to pass up an opportunity to get some friends together and put out a spread of appetizers and finger food? Ummm. Not me. 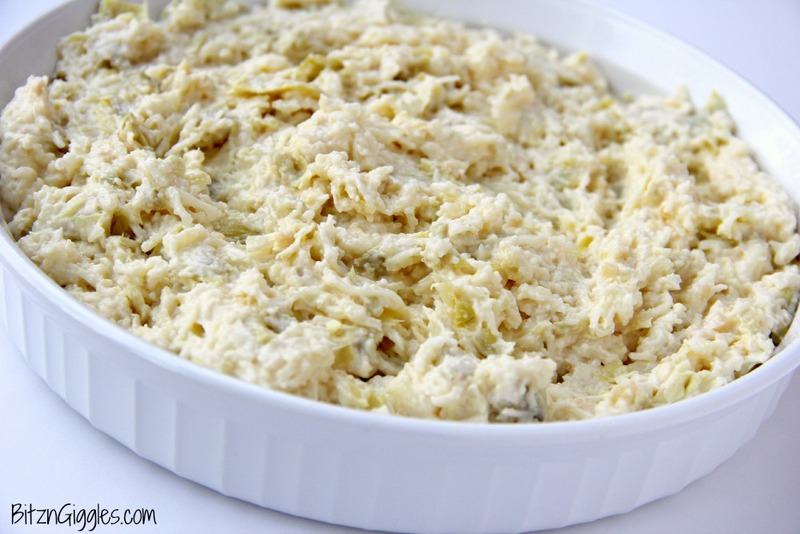 One of my favorite dips of all time is this Cheesy Artichoke Dip. It’s so easy to put together and I don’t think I’ve ever had any of it left over after a party. One of the secrets to this great dip is quality cheese. 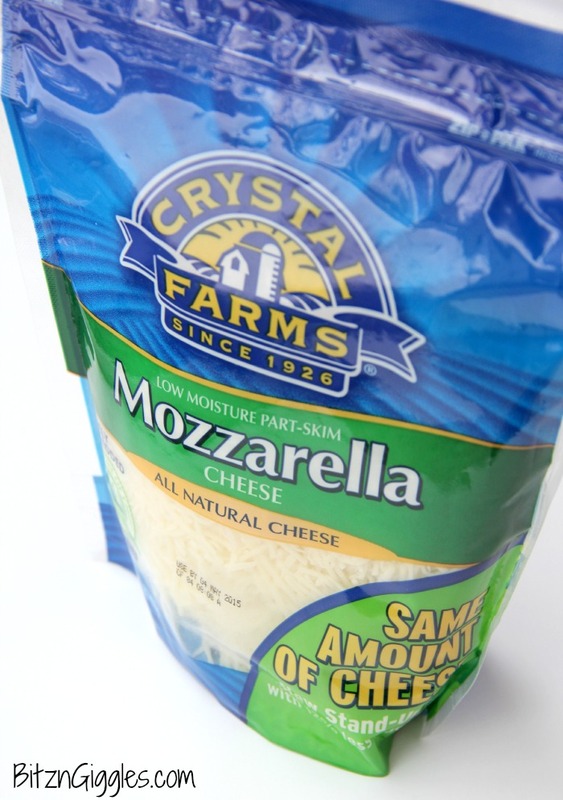 Crystal Farms® is one of the largest cheese brands in the country and is made right here in Wisconsin. It’s one of the main ingredients to this dish and I love the smooth taste and how beautifully it melts when warmed. This dip goes together literally with five ingredients. Can it get any easier than this? You mix all of the ingredients into a bowl, spoon it into a baking dish and bake it at 350 degrees Fahrenheit for about 20- 25 minutes. 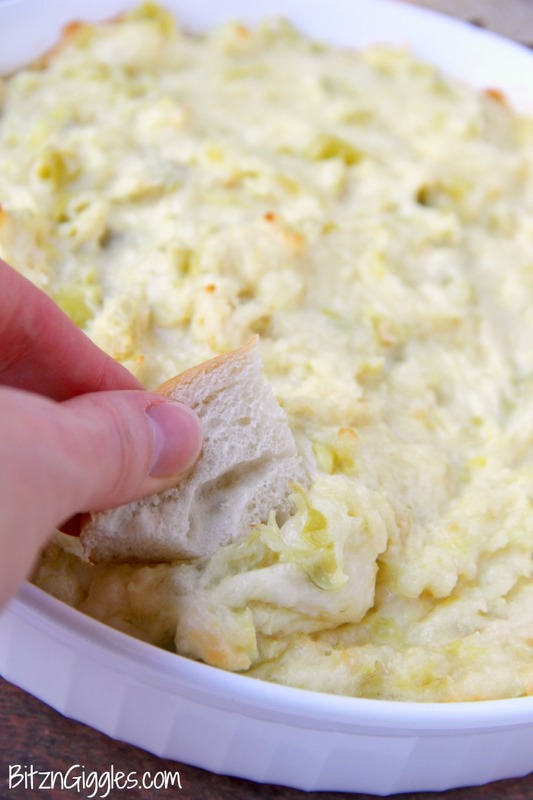 When the sides start to bubble and brown you know this delicious dip is ready to be served. Just look at how the dip changes and becomes so creamy. . .oh, so good. It’s from all of that great cheese. I’ve found that it goes wonderfully with bagel pieces. I’m not going to lie. I make this dip all of the time – even when we’re not having a party. You can mix up the ingredients ahead of time and bake it when you’re ready to enjoy it. Get this. . .if (for some odd reason) you have any leftovers, this dip tastes great even when warmed up. Yum. So, cheesy, so satisfying, soooo good. I hope you enjoy it as much our family and friends do! Visit Crystal Farms Favorites and follow Crystal Farms on Pinterest for more cheesy and delicious recipe ideas! 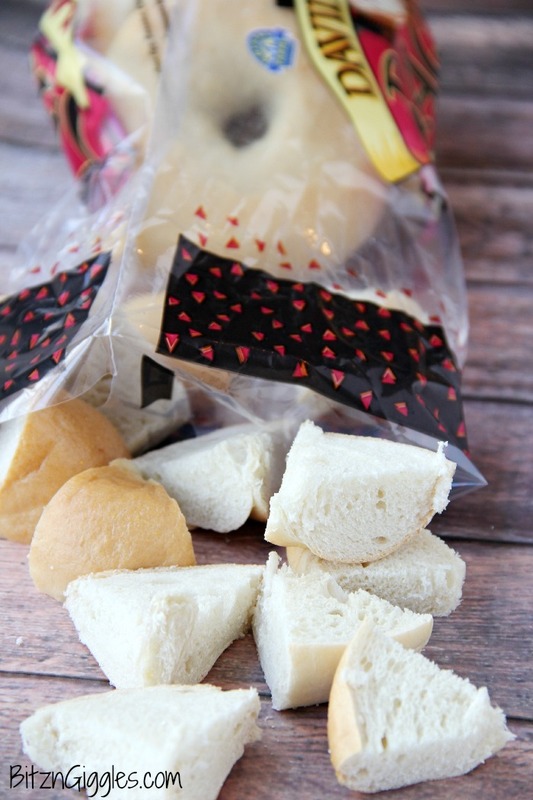 Oh, and don’t forget to enter this awesome giveaway from Crystal Farms! Register to win this beautiful Le Creuset serving platter! The giveaway will run through February 6, 2015 so make sure to enter by leaving a comment in the Rafflecopter box! Good luck! 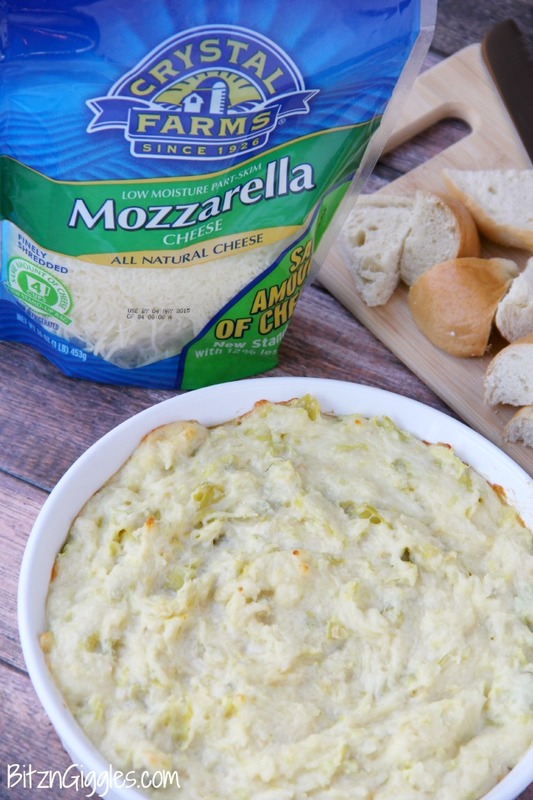 A delicious, cheesy dip that goes together quickly and with only 5 ingredients! Combine all ingredients together and put into 2 quart baking dish. Bake for 20-25 minutes or until lightly golden brown around the edges. Serve with plain bagel pieces. 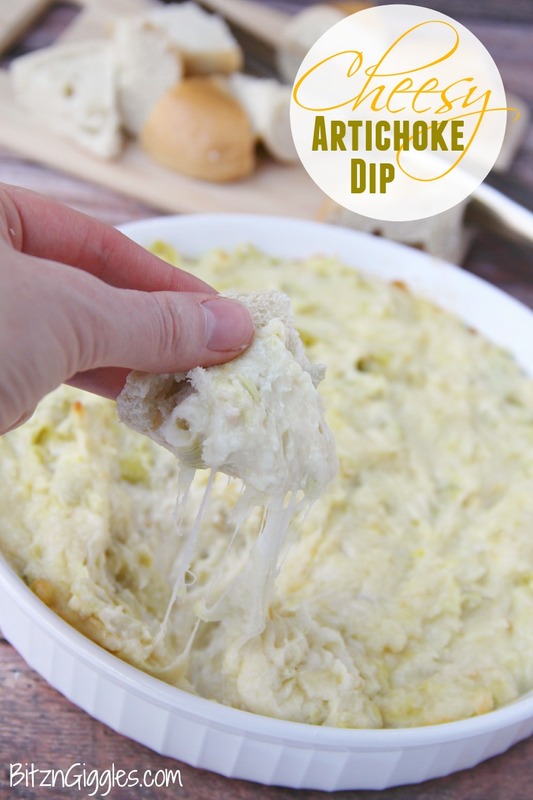 I absolutely love artichoke dip, and using bagel pieces as dippers is a fun idea. This looks delicious! p.s. – my favorite cheesy appetizer is queso fundido w/ salsa, roasted shrimp, and a bit of tequila! Or maybe just a good baked brie with some sort of jam or another on top… that’s a hard choice! What beautiful pictures. 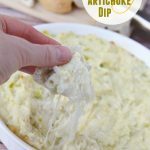 It looks like such a great dip and easy to make too. I think I’ll give it a try for our Super Bowl party this weekend. I hope you do try it, Joanie. It’s delicious! I want to dive into this bowl of dip! Perfect for game day! This looks so good! I love cheese+artichoke anything! Its the best! this sounds great! and what a fun giveaway! I’m pretty boring…I like the old Velveeta and Hormel chili dip. But I am definitely making this for the Super Bowl tomorrow. Possibly a new favorite?!? Cheesy dips are the best part of the superbowl! My favorite cheesy appetizer has to be mozzarella sticks, dipper in marina sauce. I love my Cheddar Ranch Dip served with crackers. It is so good! 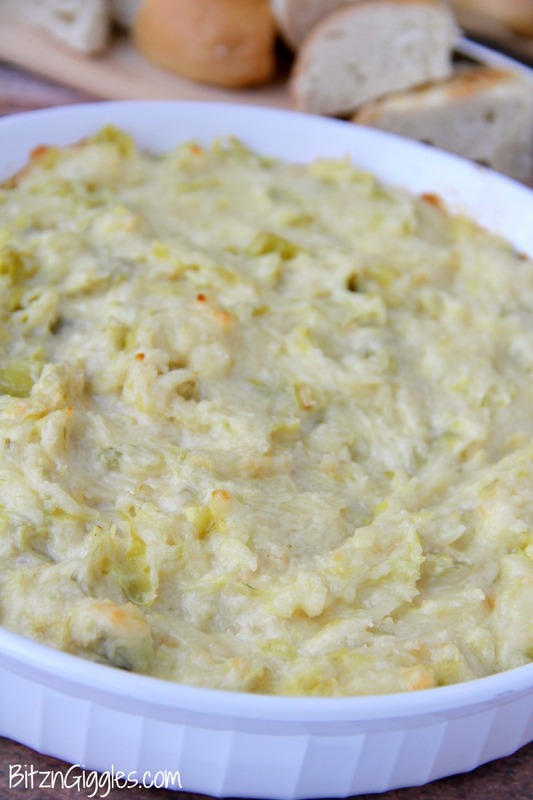 It’s a hard call between this gooey deliciousness or spinach and artichoke dip! Luckily they are pretty close but loving how artichoke is the star here! My favorite cheesy appetizer would be fried macaroni and cheese. That being said, I really love any type of nachos, and french onion soup with fontina cheese, even though technically it’s not an appetizer. Thanks for the chance to win this awesome platter! This sounds amazing! I wish I had some right now. Thank you for linking up to Party Time and we hope to see you again next week! I love a good pimento cheese spread! As a dip or sandwiches, you can’t go wrong! Yum! Thanks for linking up to Tips & Tricks! Hope to see you next week!